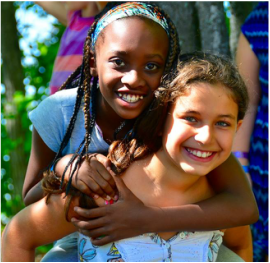 Two of our campers having fun together at Camp Chickagami 2015! Each summer, we sponsor up to 40 children to go up north for a week long adventure. Our 2018 campers will attend Camp Chickagami in Presque Isle, Michigan. The camp experience teaches the children Christian values, while providing swimming, canoeing, singing, games, and chances to make lifelong friends. If you are interested in your child attending camp this summer, please contact us for registration information. Twenty One 6th-8th graders ARE AT Camp Chick's Middle Camp from July 8 - 14. Up to 20 3rd-5th graders will attend Camp Chick's Junior Camp from July 22 - 28. ​Would you like to sponsor a child to attend camp? Call us today! Each year, different groups help us pack Thanksgiving Boxes. Pictured above are youth from Court Street United Methodist Church and International Academy of Flint! Since 2009, we have been helping a minimum of 100 families enjoy a typical Thanksgiving meal together by providing all the "fixins" and a voucher to purchase a turkey! 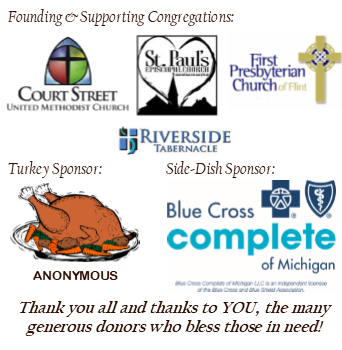 ​Special thanks to the following for helping make our 2017 Thanksgiving box program a success and blessing so many! In 2017, we served over 390 people! 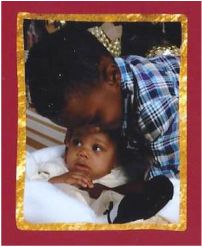 Two of the children blessed to celebrate Christmas in 2015 thanks to you! In 2017, we served 356 men, women and children who were blessed to celebrate Christmas! 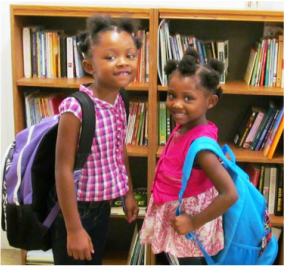 These girls LOVE their new backpacks and clothes. Look out school, they are ready to learn! For many children, going back to school is a fun time of shopping and preparing for a wonderful new year of learning. Unfortunately, for many it's trying to find hand me downs that aren't falling apart or wearing the old faded, stained clothes that really don't fit right. Each year, we sponsor a minimum of 100 children, providing them with 2 new outfits (including underwear, socks, shirts, and pants), a new pair of shoes, a new belt, and a new backpack full of school supplies! Our goal is to send as many children as possible back to school with confidence; ready to learn! In 2017, we served 223 children! *Children are referred to Crossover by MDHHS and other area agencies. 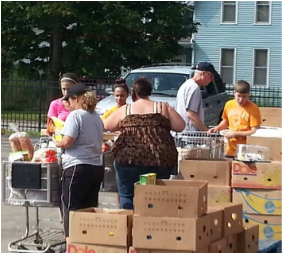 Court Street United Methodist Church's volunteers "shopping" to prepare bags for clients. We take food to the streets by partnering with area churches and sponsoring Mobile Food Pantries throughout the spring, summer, and fall months. For our efforts we are feeding around 500 individuals at each event. ​In collaboration with the MSU Extension, we provide the opportunity for our clients to learn food safety, nutritional information, shopping/budgeting and other techniques to prepare healthier meals for their families and possibly develop skills useful for obtaining meaningful work in the food service industry. Families also receive a week's worth of supplemental nutrition...fruits, veggies, and more to help insure success in implementing the lessons learned in class! ​At the end of the six weeks, students receive a certificate from MSU Extension and a cooking implement to help remove barriers to their success from Crossover. *Other programs will be added as details are available. ​Please check back!